As VR and gaming experiences evolve so do 3D audio tools. However, VR and location based experiences have brought sonic challenges that aren’t solved simply by applying 3D audio solutions. To craft truly compelling and fully immersive experiences we must explore new dimensions of sound. What are these dimensions and how do they alter sound in VR? How can you use the latest neural and auditory system studies to hack the player’s brain and choices? Prepare to expand your mind by watching this 60 minute presentation that will show how to take your VR and gaming experiences into the next dimension of sound! This is a video of my presentation at the 2017 Austin Game Conference . I’ve combined the video of the presentation with my edited slides so anyone interested in using audio to create more compelling and immersive VR experiences can watch and learn. I demonstrate my work from Robo Recall (Physics sound), The Mummy: Prodigium Strike (Sound design, implementation, mixing, audio lead), Salt Star VR (Sound design, mixing), and Super Lucky’s Tale (Music, music mixing). Note: I didn’t work on the examples from Battlefront 2, The Stanley Parable, or Inside. The gifs and clips from rick and morty, Tim and Eric and JonTron are inserted for hilarity. Go buy and support all these games, shows and creators. They deserve it and you won’t regret it. The beautiful artwork in the header image was created by Damian Kastbauer during the talk and I find it to be a rare glimpse into his mysterious and magical mind. After months of hard work I can finally talk about the latest VR title I’ve been a part of! 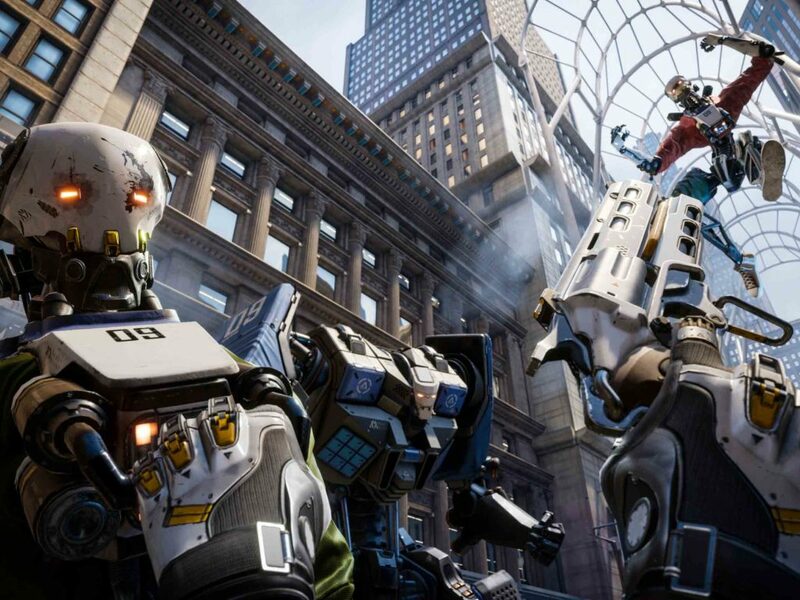 Epic just announced Robo Recall, a virtual reality experience where you can blast and tear apart robots to your hearts content. It uses the new Oculus touch controllers and I’ve been fortunate enough to design the physics sounds for the game. So far, I’ve discovered making realistic physics sounds in VR is even more challenging than normal video games. Everything needs to be just right because the VR experience itself is so personal and realistic. I’ve made many trips to thrift shops to buy new objects to bend, shake and break for all the robot mayhem that ensues. I get 100 hits a day on my post about building acoustic panels. In the same spirit of that post, I wanted to share a tutorial on how I built my own Foley Pit! Head on over to PlayDotSound, where I wrote up the article with detailed steps about the process and all materials involved! I’ll be updating the post with recordings in the future. I made the blog post right after building it and was too excited to share it to wait to post about it! PlayDotSound, the new Game Audio Tutorial Blog, has been launched! Play Dot Sound is designed to be laser focused on teaching Game Audio concepts and sharing insider industry knowledge. As a Berklee Educator, I wanted to have an outlet to share concepts that go beyond the courses I teach ranging from the basics to unusual creative concepts. Part of my personal mission has always been to give back to the community which has given so much to me! Play Dot Sound is a website dedicated to help you make the best game audio possible. Play Dot Sound is the creation of game industry veterans Aaron Brown, Brad Fotsch, and Matt Piersall. I was recently nominated for the AIAS oustanding achievement in sound design for my work on Uncharted 3. Although it didn’t win, it was an absolute honor to be a part of such a talented team at Naughty Dog. Their team does an amazing job of focusing on bringing all parts of the gaming experience together and being as cohesive an experience as possible. 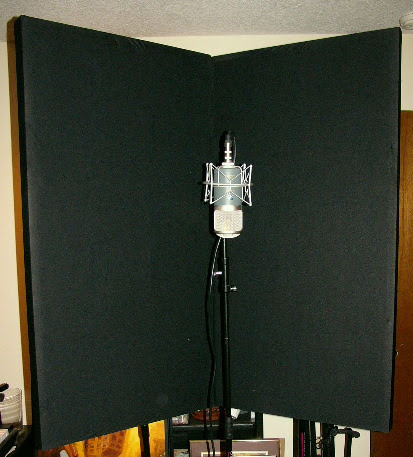 DIY Acoustic Panels – How to build your own room treatment and Vocal Booth! DIY Acoustic Panels around $30 each! One thing that has always bothered me is my untreated home studio. 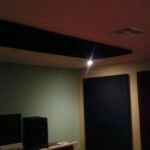 Every professional studio I’ve worked at or visited has had rooms with proper acoustic treatment. Last week I decided to have my home studio join the ranks of these treated rooms! This post covers the many hours of research, planning and building that went into making my very own acoustic panels for treatment and a vocal booth. The first thing I did was visit the numerous websites that talk about room acoustics and panels. This alone took me about 40+ hours of research. 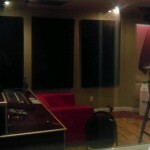 Room acoustics and panels are a very complex science that takes YEARS to master. What I learned is that, despite the daunting amount of intricacies involved with acoustics, it IS possible to make your own acoustic panels for a small amount of money. 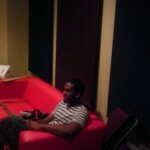 Luckily, I ran into a professional acoustician, Doug Greenlee from soundkinetics.com, at a studio get together. He provided me with a great starting point. If you ever plan on building a professional set up there is no substitute for hiring someone like Doug! 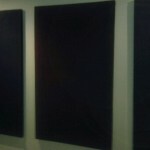 I found a TON of people who have built their own panels providing me with the motivation and knowledge to make my own. I’m going to keep the rest of this post as straight to the point as possible from here on out. If you want to learn more about acoustics or see other people’s plans I added a handy bibliography at the bottom for all your researching needs! 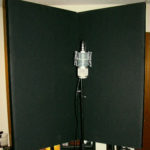 Make 8 versatile acoustic panels in one day that can be used as wall panels, baffling and a portable vocal booth for UNDER $250. Finding this material can be tricky. After calling 8 local insulation suppliers I FINALLY found it at a place called Internation Technifab. Cost:$104 for 8 Knauff 3 lb. density fiberglass panels. Buy this at Joann Fabrics which has weekly 50% off sales! CALL THEM FIRST TO BE SURE THEY HAVE ENOUGH FABRIC! Options: Jet Set, Black Felt, Speaker Grill. I chose Jet Set for its sleek look and cheap cost. Be careful though because stretchy fabrics can be very difficult to fit on the panel without folds! Cost: $43 for 16 yards of Jet Set Black. Rubber screw bumpers $16(To hold the panel an extra bit off the wall. This prevents tearing of fabric, marking of the wall and achieves more bass absorption. Picture Wire $10(25 feet of 30 lb. rated wire) AVOID any thin cheap 28 gaugewire! Electrical Tape $4 (Used to cover up imperfections in the wood and cover the picture wire. Electric staple guns work just fine. If possible, buy staples that match the fabric color! Miter Saw to cut the wood. Gloves, protective glasses and a dust mask. Handling fiberglass can be hazardous and it isn’t too precautious to wear the gloves and mask while working with it. Packing tape or duct tape. This holds the fabric in place as you work. This is ESSENTIAL if you are using a stretchy fabric like Jet Set. Start by laying down a piece of the fiberglass. Then put the boards around it and measure how long they need to be. Evaluate your wood pieces to decide which side should be the front and the back. Cover up any imperfections with the electrical tape. If these pieces work out properly then use them as templates to mark the other pieces of wood. This saves you time in measuring them out. Once they are all cut nail them together with two nails at each intersection. Then lay the fiberglass down inside the frame. Secure the fiberglass to the frame with a nail on each side of the frame. This keeps it a bit more stable. Get out your fabric and cut it into 60” pieces. After cutting your pieces will be 58” X 60”. The lacy side of the Jet Set Fabric (The 58” side) goes on the top and bottom of the panels. Set the fabric on the table so one side is just barely hanging off the edge and the other side is hanging off quite a bit. IF YOU ARE USING A STRETCHY FABRIC you will need to use tape to secure it tightly as you attach the fabric! Put your Framed panel on top of the fabric. Fold the fabric doubled up over the frame and staple it across the edge. Crease the fabric and bring it down the panel. Tape it down as it starts to take form. Staple it only after it is pulled very tight and looks clean. Now flip the fabric over the top of the panel. Pull the fabric as TIGHT AS POSSIBLE in the very middle and tape it down. This allows you to get tight seams and a professional look! TRICKY STEP: Fold the fabric under itself then pull it out so the fabric is as TIGHT AS POSSIBLE on each corner. If you don’t do this it will bunch up and look cheap. Again, once you have it very tight and no bunches use tape to hold it all in place. Then go and staple the top and bottom down. SUCCESS! At this point you are VERY close to having a finished panel. If you are confused see the photos for clarity or leave a comment! Get out the bumpers. Attach four bumpers to four of the panels 5” from the top and bottom. Then attach four bumpers to the other four panels 6” from the top and bottom. This allows the panels to stack better when alternated. Attach two screw holes 13 ¼” from the top of each panel. This measurement is very important so panels stay aligned on your walls so be careful! Get out the picture wire. Pull it through one side, pull it under, put it back through, then twist it around itself at least 6 times for a secure knot. Then use your plyers to crimp the wire together nice and tight. Pull it out to the other side and cut it at 29”. Attach this wire the same way. When it’s through be sure to use your plyers to pull it as TIGHT as possible. This will ensure the wires are all the same length and look level when hanging on your wall. Once it’s pulled tight use your plyers to crimp the wire together tightly. If you’ve made it this far you must be EXCITED! Almost there! Use your black electrical tape to cover the frayed picture wire. This makes it look professional and prevents snags. Use a black sharpie to color the staples. While not necessary, it does make it look more polished. I am amazed at the results of these panels. Not only do they work INFINITELY better than Auralex treatment, they look professional and really make a difference in my room. 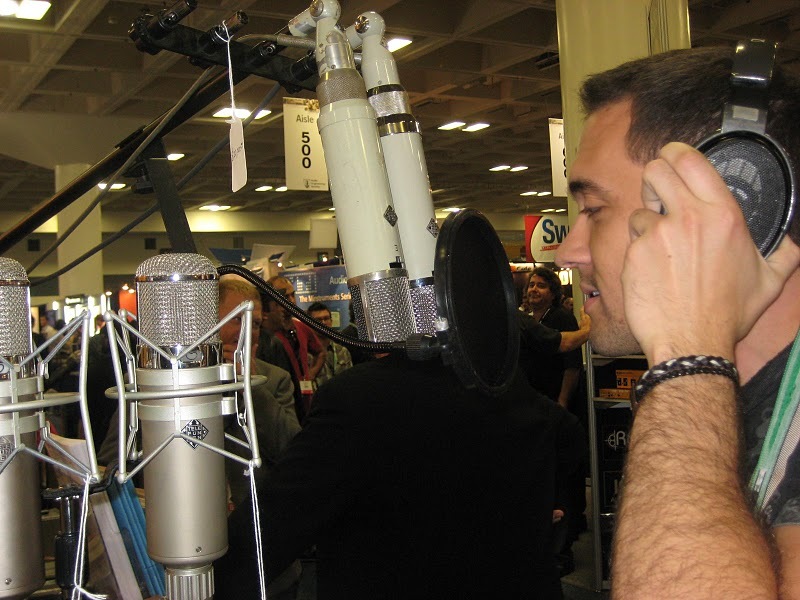 They also work great as a vocal booth or light baffles. I wish I would have made these YEARS ago. The 3 lb. 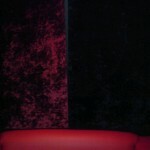 density panels absorb enough bass and reflect just enough sound to make the room treated, but not ENTIRELY dead. Make sure you make the frames for your panels. It makes them solid and professional looking and the small amount of reflective space added is well worth the extra stability! It wouldn’t take a lot of tweaking with this design to build a thicker baffle or add lots more Owen’s Corning to make them into a bass trap. See the links below for details on this. Do yourself a favor and get this done early on in your career. Why would you buy something like one SD Electronics Reflexion for $300 when you can get 8 full sized panels for $70 less??? For less than $250 it’s a no brainer to build these. If you have more money it’s probably a better bet to go with a professional company to save you the time and offer their expertise. However, anyone with some free time that wants to stretch their budget should ABSOLUTELY build their own panels. I’d like to thank my very supportive dad for taking the time to help me build these things. It made building them way more efficient and fun. I recommend you build these with a friend for the same reasons. 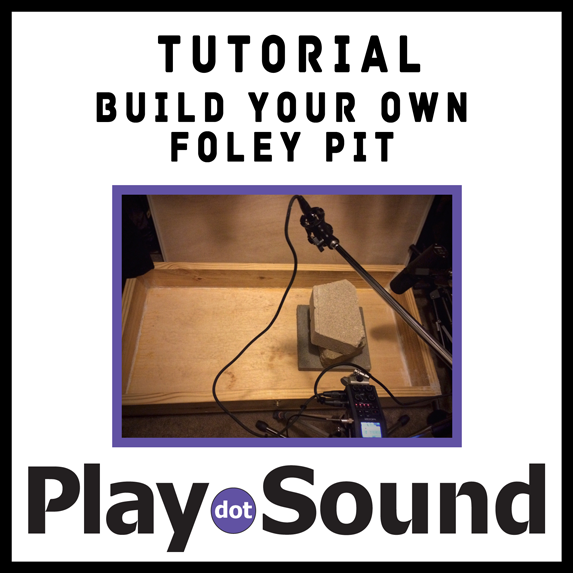 *UPDATE* – NEW POST – Build your own Foley Pit: I just wrote steps about building your own Foley Pit! If you love this post, then you’ll really enjoy learning how to make your very own wooden foley box for your home studio! A friend of a friend named Hwbilly Schleifer decided to use these plans to build his own studio treatment! I’m glad people are finding these plans useful. I thought I’d show the photos here so you can see what they look like in different settings! One AMAZING piece of hardware! I am LOVING my Line 6 M13 pedal. Seriously!!! It is an amazing piece of hardware that emulates tons of pedals in one slick package. Heck, it even comes with a built in looper! The newest OS of the M13, version 2.01, has over 100 effects to choose from. Actually, I think it may have TOO many effects. I realized I had only heard about 20 of them and never dove deep enough into it. With over 100 options it’s easy to get overwhelmed with options. The list on the website is informative, but not quite informative enough. I decided to go through every single effect on the Line 6 M13 and put them in one giant master excel sheet. This way I could rate them, categorize them and make other notes along the way. Hearing all of the effects and reading about them made me love the M13 EVEN MORE! The M13 is very good with filters and modulation. It particularly excels at Reverbs and Delays. Overall, the only category that didn’t absolutely thrill me is distortion. They work alright on leads, but none of them compare to the analog pedal equivalents. They aren’t as 3d, have less depth and seem to smear notes together when compared to the analog equivalent. It’s not that they are terrible distortions at all, but they don’t seem to give me the character or depth of analog distortion pedals. I’d give them an overall 8.5/10 when compared to the analog pedals which ain’t too shabby. Fine for a gig, but not great for recording. I use a Maxon OD808 for my SRV tones and a Fulltone OCD for the other distortion tones in my palette. 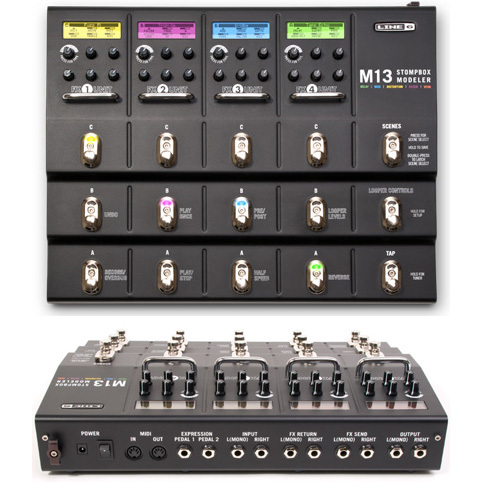 If you accentuate your M13 with some analog distortion pedals I think you would have a world class compact rig! I’m sharing this will all of you in the hopes that you can make your own notes on all of the effects. You may very well disagree with my opinions on the effects. Every guitarist will have their own opinions on the effects based on style and personal taste. Leave comments with your own thoughts on the M13 or on my excel sheet. You know that feeling you get when things have gotten way out of order and something must be done about it? Well, I recently got reacquainted with this feeling when I looked at the mess my guitar pedal set up had become. I decided SOMETHING must be done to clean it up and make it easier to gig with! It was time for me to buy my first pedal board. Pedal boards basically hold all of your pedals, run your cables and power under it to keep them out of the way and allow you to pick up all of your guitar gear easily to take it to a gig or a session with minimal set up and tear down time. Since there are far too many pedal boards and set-ups for me to cover, so I will stick with the basics. For more in depth details see the links I post at the end of this post. My gear consisted of a Line 6 M13, Fulltone OCD, Maxon OD808, Line 6 expression pedal, Banshee Talkbox, and Egnater Rebel 30 combo amp with an extension cab and a channel switcher. Finding pedal boards that fit this gear and were well reviewed took a few hours. The most helpful website was Pedalboardplanner.com. Here you can choose any pedal train pedal board and add your pedals to see how things fit! They are missing lots of effects pedals, but it’s easy to find pedals the same size to map it all out. Simple google searches provided over 20 pictures of other people’s pedal boards with a Line 6 M13 on them. The GearPage.net was also FULL of great information on pedal board sizes. Keep in mind that not ALL of your effects need to be on your pedal board. Many people keep the volume, wah, or expression pedals off of the board to save space and allow more movement on stage. After doing this research I decided to find either PedalTrain 2 HC (hard case) or PedalTrain PRO pedal board on Craigslist. After only one week of searching I found a PedalTrain HC 2 for half price with Velcro included! Most people have heard the adage “Measure twice, cut once”. This mentality will save you money and time with your pedal board. I recommend you first put your pedals on to the pedal board and arrange them so they look and feel the best to you. Be sure to leave enough space to allow you to press the pedals accurately as well as for tight 90 degree cables to fit around the inputs and outputs of the pedals (about 1” minimum). Once it looks and feels best it’s time to get out the measuring tape. Write down all the connections you need to make on your pedal board and how long the cable needs to be. If you don’t write it down you will make unnecessary mistakes! Trust me on this!! Alternatively, you can buy a Planet Waves or Lava Cable Pedal Board Patch cable kit. These seem pretty cool. They are solderless so you can simply screw on the adapters to each end of a cable after you cut it with a provided tool. These allow a perfect cable length and fit at a bit of an extra cost. I would guess these would be worth it if you have LOTS of pedals to run cabling to. I had to buy 1 15’ guitar cable (Guitar to input),1 X 3’ cable (M13 to OCD), 1 X 1’ cable (OCD to Maxon), 1 15’ cable (Maxon to Rebel 30 input), 1 X 15’ 2 channel cable (for my effects loop send and return). A bit of extra length is needed on most cables since they are run underneath the pedal board to conserve space and make it look clean. I ended up choosing 15’ cables to run from my pedals to my amp. This seemed like a good balance between signal loss and being tied too close to my amp on stage. The color coded 2 channel cable made it easier to plug in my send and returns since they both go to the same place. I’m not even going to bother talking about cable quality in this post because it’s a huge topic that will need it’s own post. Stay tuned for a new post soon about cables and how they affect your signal path! If you don’t know what an effect loop is on an amp then I recommend you read this online article. I decided to use the four cable method with my M13. This is a fancy way of saying I’m using the effects loop on my guitar amp. For more details on this see this online article. I have two signal paths: The first is to the amp input and the second is for the amps effects loop. The first signal path is Guitar to M13 -> output to Distortion pedals -> output to amp input. The second path is from M13 output -> Amp Effects return and Amp Effects Send -> M13 Effects return. SINCE this post I have discovered that the 1 spot adapter adds a decent amount of noise to the signal path. It isn’t horrendous and wouldn’t matter as much for genres like metal, but it was very audible even with my iPhone microphone. I’ve made a new video of this and put it on youtube. I have since started looking for a Voodoo Labs PP2 on craigslist and taken the 1 spot back. I’m changing this section to reflect what I now know. There are many options to power pedal boards. Pedals can have a HUGE variety of power requirements. Most are 9v pedals, but my OCD accepts 9V-18V, my Line 6 M13 requires AC 1400mA of power, and many others have their own power supplies that are required at this time in order to run properly! Also, many power supplies give off heavy noise that gets into your signal path. The M13 is EXTREMELY noisy and must be kept around 1 foot away from your signal path. Sound complex? It sure can be. What you choose as a power supply must be based on your own personal rig and power requirements. I looked into the One Spot, Voodoo Labs and T-Rex engineering and, after LOTS of research, ended up choosing the Voodoo Labs ISO-5 for clean quiet power and it’s size. If you have LOTS of pedals that use 9v or 18v it would probably be a better investment to go with the more expensive options. The ISO 5 had enough outputs for me including two extra outputs if I add more pedals. Whichever power supply you pick should have isolated outputs and a toroidal transformer to minimize noise. I chose the Voodoo Labs ISO-5 since it has an 18V output, plenty of 9V outputs for my needs AND it fits underneath the old PedalTrain 2 I bought. The outputs of the ISO5 are blocked if the supply is mounted this way. It ended up having to be mounted upside down. If possible you should buy a power supply that fits underneath your pedal board so it’s out of the way and the pedal board sits normally on the ground. 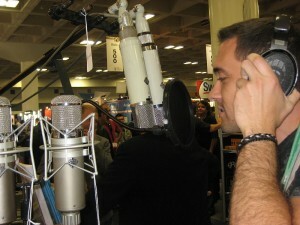 After lots of research I ended up going to guitar center and trying out the PP2 and ISO 5 from Voodoo Labs. It turns out that ONLY the ISO5 would fit properly with my PedalTrain 2 unless I drilled more holes. Voodoo Labs ISO 5 mounted upside down and fitting PERFECTLY underneath my old Pedal Train 2. I used velcro to hold down the cables and power supply. I even had to mount it upside down because otherwise the outputs and power input wouldn’t be accessible. See the photos to figure out exactly why. The picture shows that the only way it would fit is in this one particular place. For now I just used velcro, but I have plans on getting long zipties so it’s even more secure. So what power supply should you use??? Google is your friend! Figure out what power your pedals need and whether or not a unit like the Voodoo labs can handle them all. Keep in mind that professional power adapters like the Voodoo Labs PP2 are well worth the money if you care about noise in your chain! If you take your playing seriously then you should pick something with isolated outputs and a transformer! Going cheap on a power supply may seem like a good idea, but i just learned first hand how much noise it adds and ended up paying extra for a nicer power supply. It was WELL worth the extra $70 and even makes my OCD pedal sound better at 18V! Note how all power cables are separate from the signal path. Also note how tight everything fits. Now it’s time to get out the Velcro, cables, pedals , power and put it all together! Exciting huh? 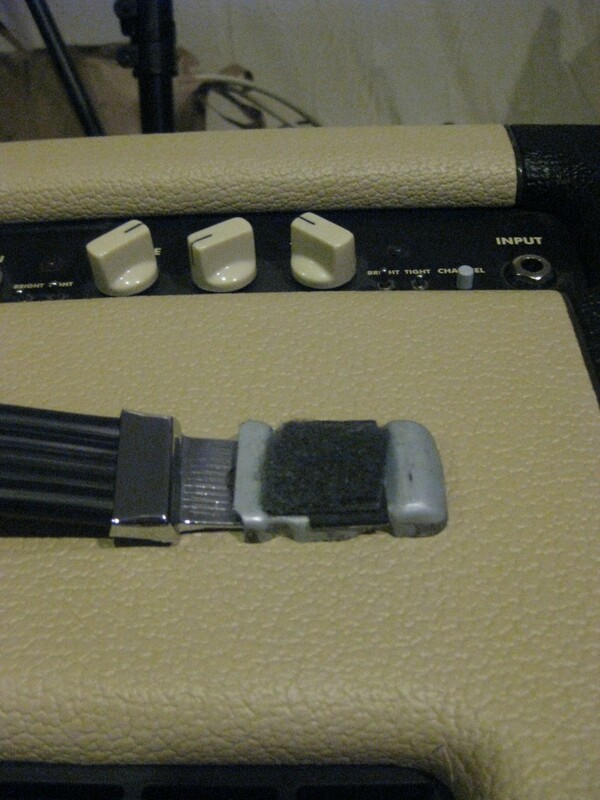 First I made sure the Velcro on the pedal board was secure. 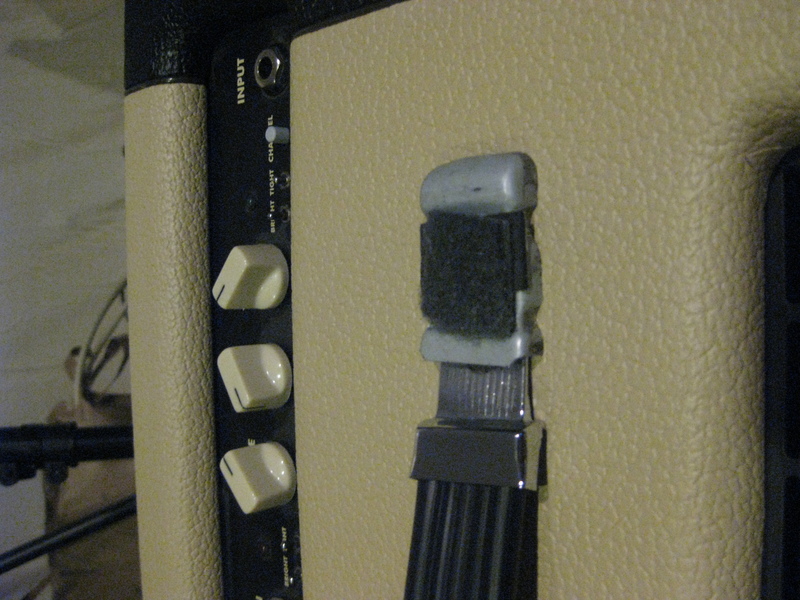 Then I put Velcro on the bottom of each pedal. Be aware that some gear requires you to take off the rubber feet so the Velcro will stick. I recommend taking off the rubber and leaving in the screws so the pedal doesn’t fall apart. Also, don’t put Velcro over the screws in case you have to take it all apart. Keep the rubber feet in a bad in case you remove the pedal from your board. Then I put the pedals on the board in the order I had previously decided on. I put the cables through one hole on the back of the pedal board and the power through the other. This allowed me to isolate all power from the signal path. I also used Velcro to keep cables out of the way and make everything nice and tidy. 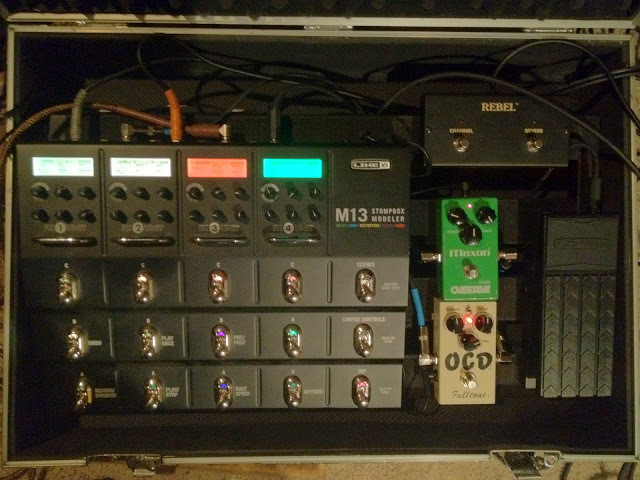 After days of research and lots of planning I finally have my own pedal board! I can’t tell you how great it feels to simplify your gear and have it ready to go at a moments notice. It only cost me about $170 to put it all together using Craigslist and a few Guitar Center purchases. Days of planning and work finally paid off! One last word of advice: It’s EASY to go down the rabbit hole on every one of these topics. You could spend your entire life doing nothing but learning about gear instead of playing your damn instrument. At some point you need to make some decisions and just play some music. The Tone Chef M13 4 cable method article. 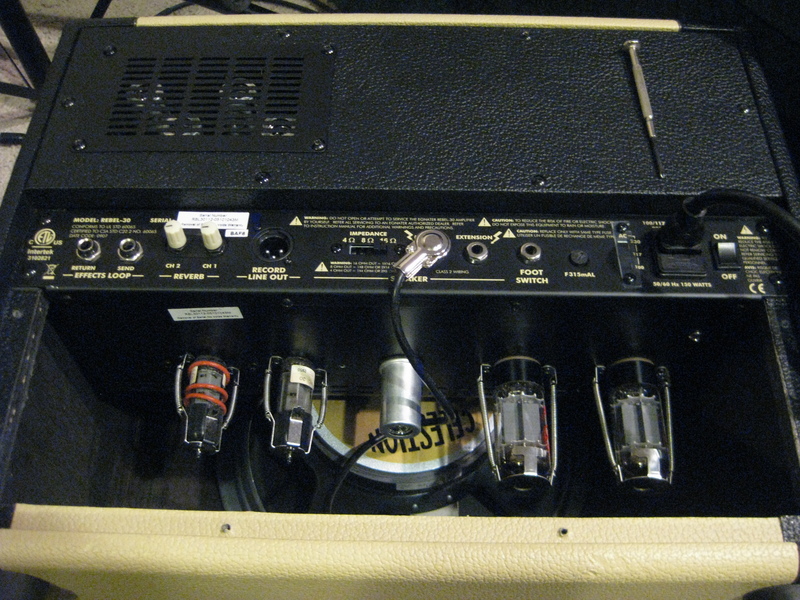 Tube amp combos have many pros and cons. It is a pain when you have to troubleshoot bad tubes, rattling in the amp, or other issues. However, when a tube amp is of high quality it can simply sound amazing and blow every hardware and software tube emulator out of the water. I, and most pro guitarist, think the quality of the sound is worth the minor troubles and costs tube amps can bring. I recently purchased my very own used Egnater Rebel 30 Tube Combo amp to get that elusive tube amp sound. I’m in love! First, let me say that the tone it gets is of boutique quality. It’s tones are easy to dial in. Both the clean channel and drive channel are everything I’ve ever wanted out of an amp. The effects loop is very useful with my M13 and the amp takes distortion pedals VERY well. I wish I had this thing when working with bands in the past. I bought it used at only $600,but it had a few small issues. This post is for anyone buying a used tube amp. It can be hard to find good information on these things. First, I noticed that handle on the Egnater combo was rattling and not very secure. 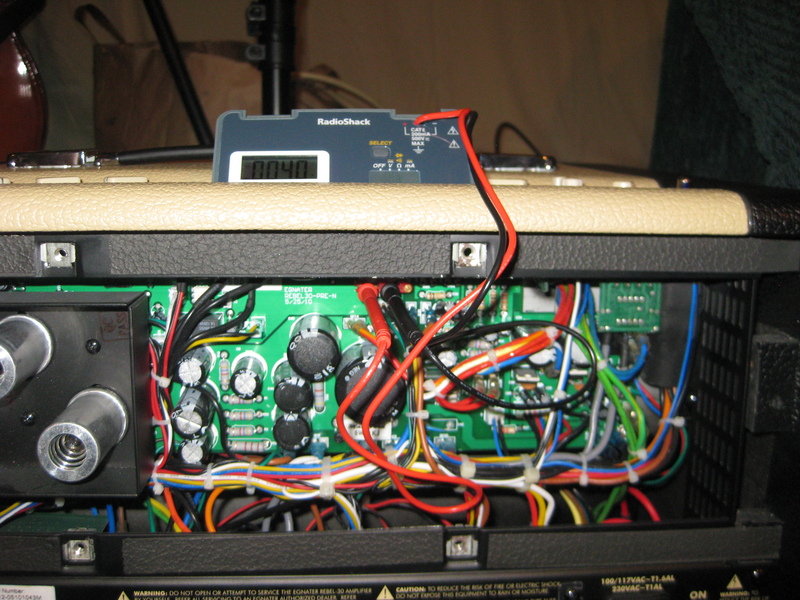 I saw the same problem on a different Egnater amp so it may be an issue with some of these amps. This was an easy fix. I just cut out a small piece of foam, removed the piece that was rattling by popping it off, put the foam in there, and replaced the handle piece. Now it is snug and doesn’t move at all. After fixing that rattle I noticed that there was another noise coming from the amp. Whenever I played a low A,Bb, or B there was a light glassy-like rattling. After lots of research I found out that this sound is from a tube. It’s easy to figure out which tube is rattling because the rattling stops when touched. BE CAREFUL OF TOUCHING THE TUBES WHEN ON!!! They get VERY hot! Always use gloves when handling tubes to prevent oils from getting on the tubes. I have since learned that combo amps often cause tubes to rattle after time because the sound waves cause the tubes to rattle a lot. 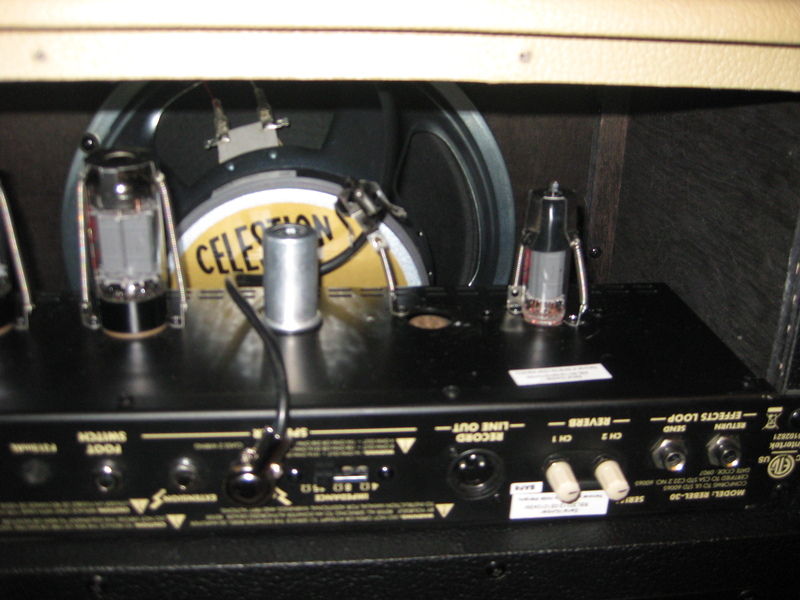 To prevent this you can use an extension cab so the amp doesn’t rattle the tubes at loud volumes. The only fix, if you want to use it as a combo and be rid of the tube noise, is to buy new tubes. I initially bought some tube dampeners in hopes it would hold the tube and dampen the tube rattling. Unfortunately, they didn’t have any effect on this type of tube rattle. I did end up using them later…. Read on to see how. Everyone under the sun seems to like different tubes for different reasons. After LOTS of research I found that JJ tubes are reliable and not very prone to rattling. Using matched tubes is said to be of high importance, but no one could point me to solid proof of this. I bought matched tubes anyway since it isn’t that much more expensive. Installing new tubes is very easy. Put on gloves, remove the tube retainers, hold them at the base, lie it up with the open connections and gently push them in. After putting in the new tubes you have to Bias them. This involves removing the back panel, adjusting a potentiometer (one for EL84 and one for 6V6) to 40 mv. This requires you to have a multimeter. I bought the RadioShack pocket multimeter which is cheap, small, and fine for these purposes. Follow this link to get better details on how to bias your tubes. Eventually I had the new JJ tubes installed, biased, and ready to go. I re-attached the tube retainers and added the tube dampeners to them. This prevented sympathetic ringing from the tube retainers at low recording volumes. If you want some tube dampeners leave a post and I’ll respond with a link to buy them CHEAP from a dealer. FINAL SET UP: JJ 6V6, JJ EL84 tubes and tube dampeners around the tube retainers. After a big of work and research I got this amp sounding and working better than new! 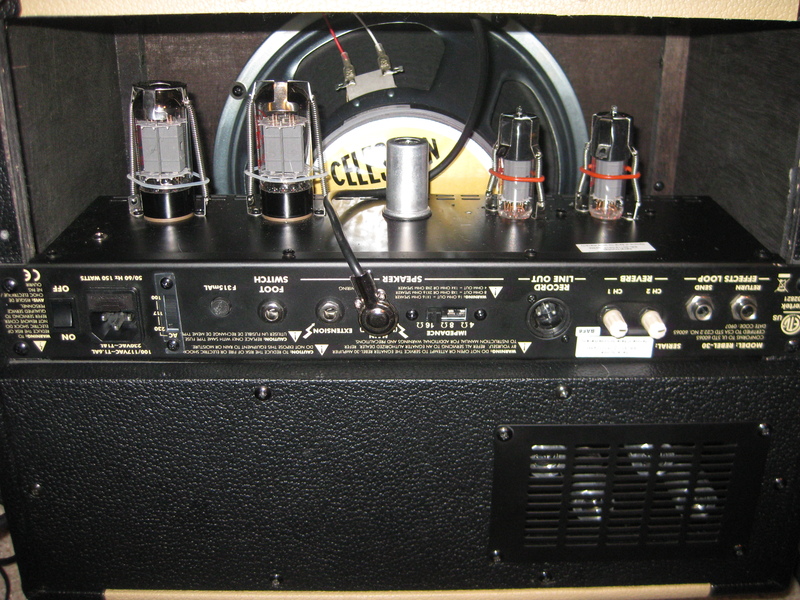 Instead of paying $900 plus tax I paid $650 and learned how to take care of my tube amp in the future. 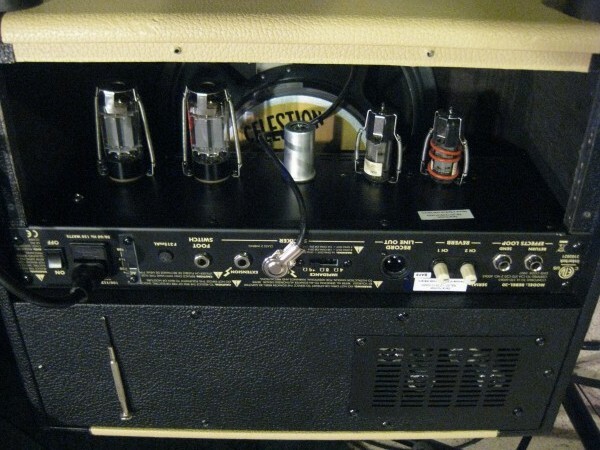 Tube amps like this still sound amazing and are well worth the work. 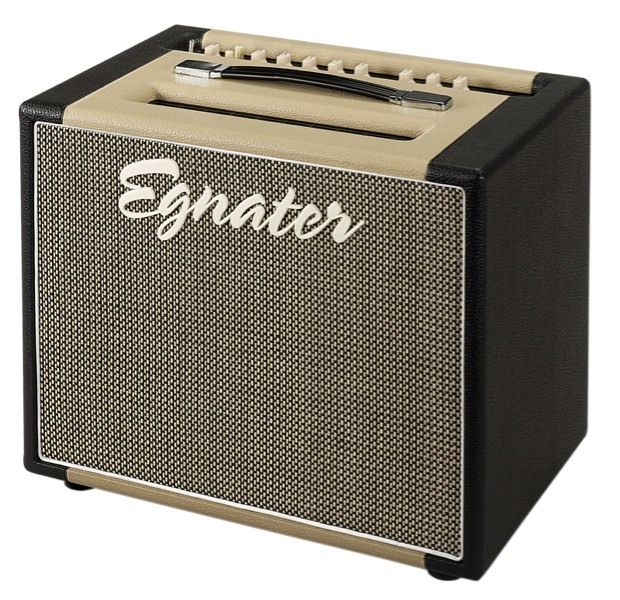 If you are looking for an amp you owe it to yourself to hear the Egnater Rebel 30. You simply CAN’T beat it for the price. It has a boutique sound to my ears. It actually sounded better than the amps I heard around $1500. I’ve learned a lot recently about tube rattling. Tube rattle often sounds like small BBs rattling in a glass tube. It turns out that a bit of tube noise is expected in combo amps due to the sheer dB level in such a small space. If you plan on recording your amps it is recommended by many professionals to get a separate cabinet from your amp head. This means either buying an Amp head and Cabinet separately OR buying a combo that allows you to hook up to another cabinet. This way the speaker that’s moving isn’t rattling the tubes. Keep in mind that tube dampeners don’t accomplish much if anything if the rattling is within the tube. I learned that for my issue it didn’t make a difference. I ended up buying a second Egnater Rebel 1X12 cabinet for versatility. Now I can play through just the combo at rehearsals (16ohm), play through just the extension (16ohm) OR play through both for a lot more volume at bigger places (8ohm). An extremely versatile setup. I can use the extension cab for recording, the combo alone for a rehearsal amp, or both for playing LOUD! When using more than one cabinet make sure you set the ohms to the right setting. THIS IS VERY IMPORTANT! It’s easiest if your cabinets have matching ohms. In this case you just set the ohms to half of each cabinets ohm setting. Since both are 16 ohm cabinets I set the output to 8 ohms when using two of them. Here is the formula. Hans at Egnater recommended I avoid using multiple cabinets that don’t match ohms since the math gets complicated and the output ohm settings don’t perfectly match these types of set ups. I should also add that Egnater has been VERY quick to respond to all of my questions. Their support is one of the best I’ve ever worked with! If you hook up multiple cabinets MAKE SURE you use speaker cables of at LEAST 12 gauge. These cables are much thicker and made specifically for this type of output. DO NOT USE INSTRUMENT CABLES TO HOOK UP AMPS TO CABINETS!!! Buying used amps can be risky with all the things that can go wrong. In this case it was well worth the savings. Always be sure to put the amp through it’s paces when you try them out so you find issues right away. If you have issues like I mentioned you’ll probably be fine with these fixes. If something is fizzy, cutting out, or smoking then you’ll need to talk to a tube amp repair guy which can take a month and cost quite a bit. I hope this clears up some questions you all may have had about tube dampeners, tube biasing, and the Rebel 30 Egnater combo. I LOVE this amp and so does EVERYONE that hears it!!! I couldn’t recommend it enough!